Whether you’re religious or not, this old Dominican <a href="https://www.inhabitat.com/2008/09/24/som-cathedral-of-christ-the-light/">church</a> will certainly bring you the enlightenment you’ve been seeking. 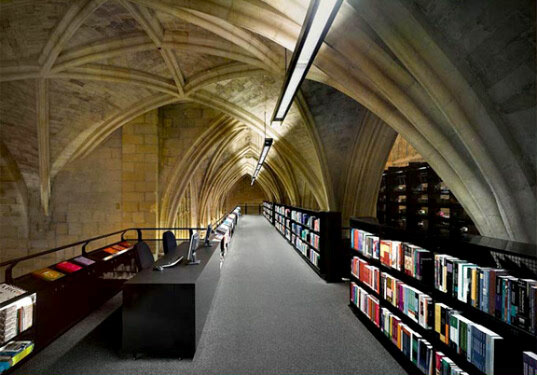 After months of renovation this magnificent structure originally constructed in 1294 has opened its doors to the public as a “brand new” bookstore in the heart of <a href="http://en.wikipedia.org/wiki/Maastricht">Maastricht</a> in the Netherlands. 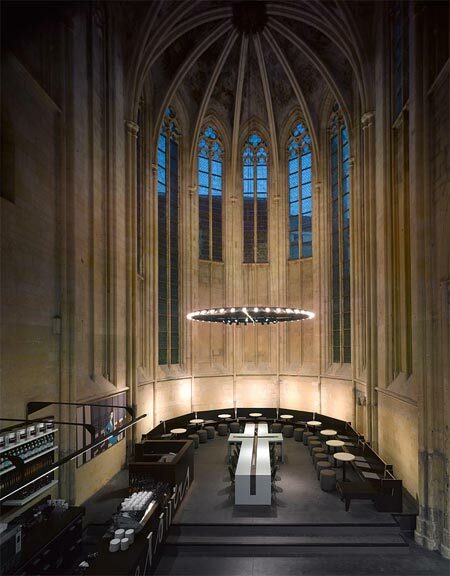 A superb example of <a href="https://www.inhabitat.com/2009/01/28/garden-museum-by-dow-jones-architects/">adaptive re-use</a>, the Selexyz Dominicanen infuses rich and historic architecture with plentiful shelves ripe with information. Dating back to the 13th century, the structure was a Dominican church until Maastricht was invaded by Napoleon in 1794 and the group was forced out of the country. 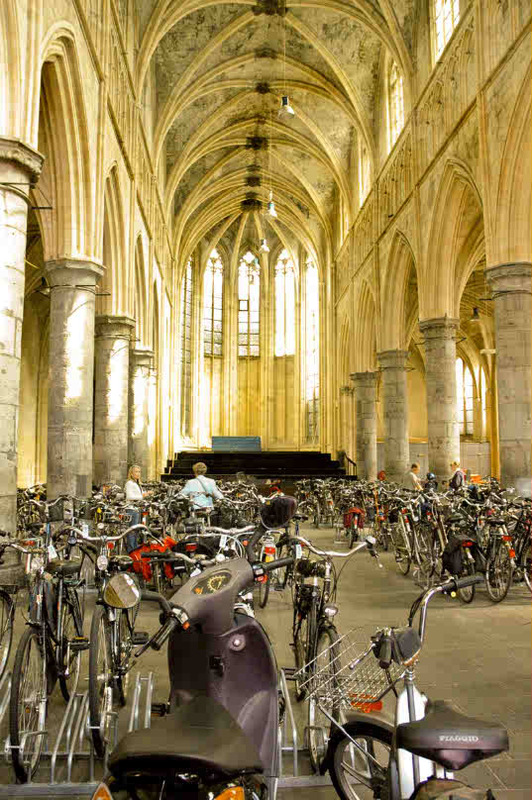 Since that point it has been briefly used as a parish, then a warehouse, then an archive, <em>then</em> a giant parking lot for <a href="https://www.inhabitat.com/2009/07/21/transportation-tuesday-top-five-eco-chic-bicycles/email/">bicycles</a> (not such a terrible idea) and finally made over into a bookstore. 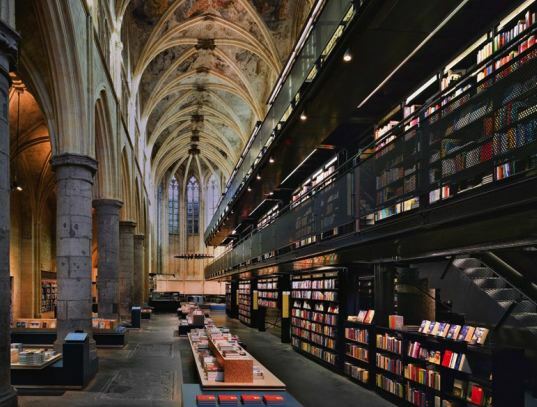 Led by architecture firm <a href="http://www.merkx-girod.nl/">Merkx + Girod</a>, the new installations are highlighted by a towering, three-storey black steel book stack stretching up to the stone vaults. The highest shelves are reachable by lift or by a set of stairs within the sleek, well-made stack. The views provided from the top shelf along the nave of the church are nothing short of uplifting. At the back of the church customers and visitors can sit and admire the beautifully renovated 14th century ceiling frescoes, or chat over a cup of coffee in the café situated in the former choir. In a bit of humor the bookstore also installed a cross-shaped reading table where anyone can sit and flip through the magazines and newspapers kept in the slats of the table. 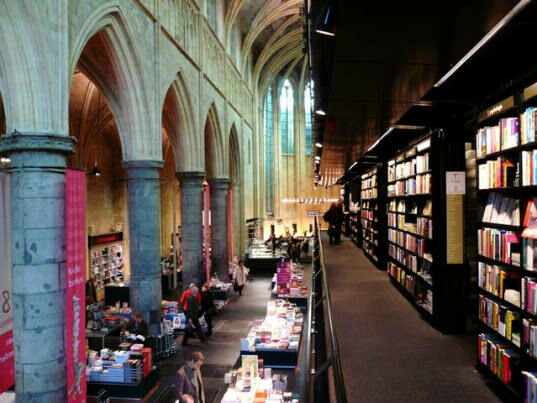 The design has won the Lensvelt de Architect Interior Prize, and in 2008 <a href="http://www.guardian.co.uk/books/2008/jan/11/bestukbookshops">The Guardian</a> called it the "best bookstore in the world". Whether you’re religious or not, this old Dominican church will certainly bring you the enlightenment you’ve been seeking. 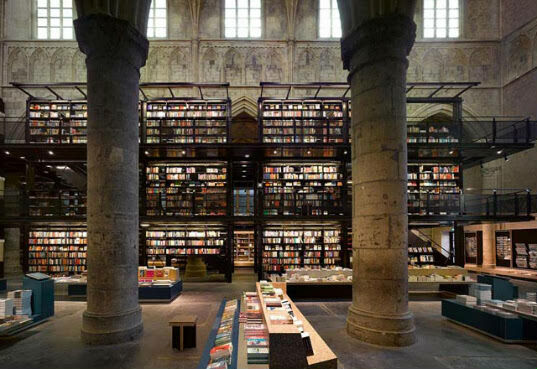 After months of renovation this magnificent structure originally constructed in 1294 has opened its doors to the public as a “brand new” bookstore in the heart of Maastricht in the Netherlands. 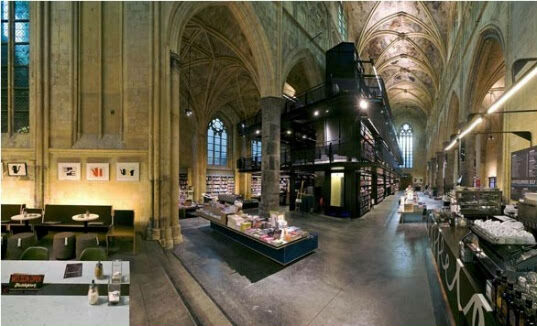 A superb example of adaptive re-use, the Selexyz Dominicanen infuses rich and historic architecture with plentiful shelves ripe with information.